People have diverse hobbies and interests. Some may not enjoy dancing, drawing, athletics, or a particular subject in school...BUT have you ever met anyone who doesn’t like music?! Maybe you and a friend don’t enjoy the same genre of music, however, nearly everyone likes one kind of music or another. Learners who are taught in a fun and creative way are excited to come to class. ESL instructors in particular, can keep their students engaged and motivated to learn by implementing music in their lesson plans! Music can have a global impact. Many students share favorite songs regardless of their cultural background. ESL students can feel real progress in their level of English when they can begin to sing along to the chorus or learn to separate what seems like an endless stream of lyrics. Teaching through music can help with word and information retention, elevate or calm a mood and inspire discussions. Students of all ages can enjoy English music and teachers can relate songs to almost any topic or activity. WURRLYedu provides a series of engaging and creative exercises, and games for use within an ESL context. Our catalog contains thousands of songs with recommendations for each type of lesson plan. Warm-up Exercises. Based around singing anthemic songs, these exercises are ideal for getting students in the mood to interact in class. Rap Contests. Great for helping students practice diction and understanding the flow of the English language. Creative Backing Tracks. Students can write their own lyrics and set them to our backing track, allowing for a creative way to interact with their vocabulary. Call and Response Songs. These games are ideal for helping students practice sounds and learn new words. Verb and Noun Games. Within the context of a song, students will need to elaborate on pre-established lines by adding new elements. 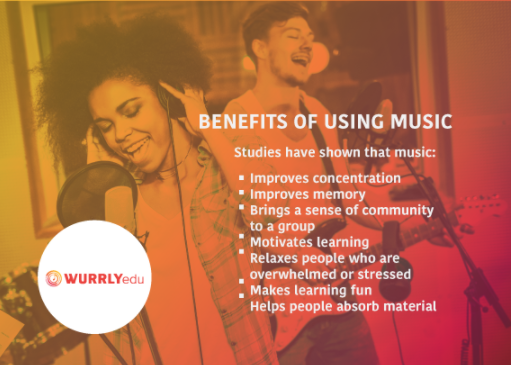 By incorporating music with WURRLYedu in an ESL classroom, instructors will be able to teach the natural speed and flow of English speaking, review previously learned ESL vocabulary and grammar, and increase students’ cultural understanding. Please make sure to keep up with our blog and follow us on Instagram and Facebook to receive more updates on WURRLYedu! Feb 13 7 Ways WURRLYedu Can Help You! Feb 13 WURRLYedu's Core Curriculum!